Sometimes you come across a Hamilton watch that looks familiar but you can't seem to place it. There can be a couple of reasons why you can't identify it for sure. One reason is that Hamilton had an "awards division" that catered to companies that purchased watches as awards for service anniversaries. Hamilton would often modify designs from discontinued models so that recipients wouldn't find their award watch for sale in a local jewelry store. Another reason is Hamilton made some models specifically for export to the European market. These models occasionally make their way back to the US. There are a number of known European models and plenty of watches yet to be identified too I bet. European models are usually identified as "European" because they have a 5 digit model number on the back. 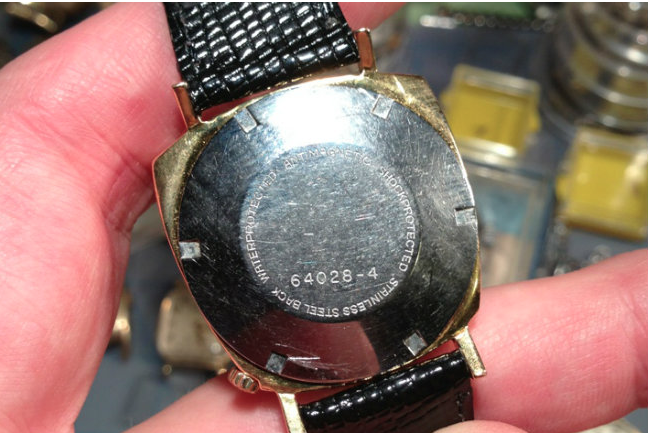 Some American watches are identified by model numbers too - but they will have four-digit numbers instead of five. 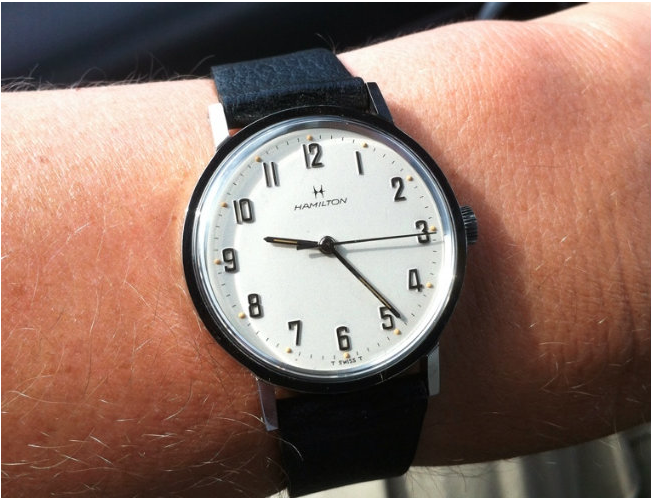 For example, here's a wrist shot of my model 64028-4. It's a calendar model and it's semi-cushion shape with crown at 4:30 really caught my eye. Turns out there are a couple of variants of this watch. The -4 model came in yellow rolled gold plate (RGP) and there's a -3 model that came in white (stainless steel). On the reverse you can see it's marked a little differently than the usual Hamilton watch and the model number is clearly inscribed. It's unique shape and crown location looked pretty familiar when I purchased it. I thought for sure it was a model that I had seen before. 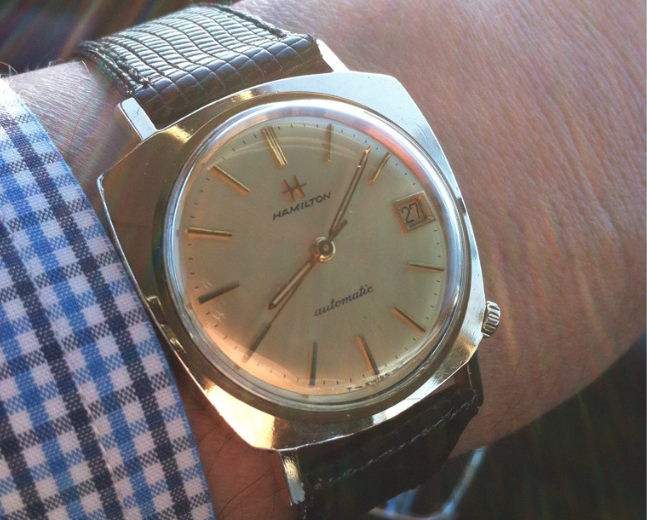 Turns out it looks an awful lot like a Hamilton Electric model called the Taurus from the early 1960's. I have another European model that is reminiscent of the "Sea-somethings" from the 1960's. There are a lot of stainless steel models with somewhat similar dials - but no exact match. This one is also a lot larger than the typical 1960's models. It is called a 61001-3.